That cool jacket Nordstrom pinned? Click—buy it. That new book from your favorite author that they just tweeted? Click—buy it. Those stylish flats that Aldo posted on Instagram? Click. Bought. This is becoming more of a reality as sites like Pinterest, Instagram, and Twitter have been rolling out “Buy Now” options that allow users to make purchases within the social media applications themselves. Even Google is getting in on the action with a “buy button” appearing alongside mobile search results in an effort to drive more commerce online. The nature of online shopping has been undergoing an interesting shift lately, moving from catalogs and websites to social media as digital consumers are no longer concerned with limiting their activity to one particular app: why depend on one source when there are countless apps conveniently available in the palm of your hand? It makes sense, then, that more and more purchases are being made from mobile and digital platforms. Pinterest has been working on fine-tuning this feature for a while, and is even partnering with big-name retailers like Macy’s, Nordstrom, and Nieman Marcus. Social media has long enabled marketers to reach consumers across multiple touch points, and now they can use it for creating points-of-purchase. This is important for marketers, as it creates an opportunity to deliver targeted experiences for consumers, drive revenue from advertising partners, and create a simple and unobtrusive way for users to interact with those advertising partners. 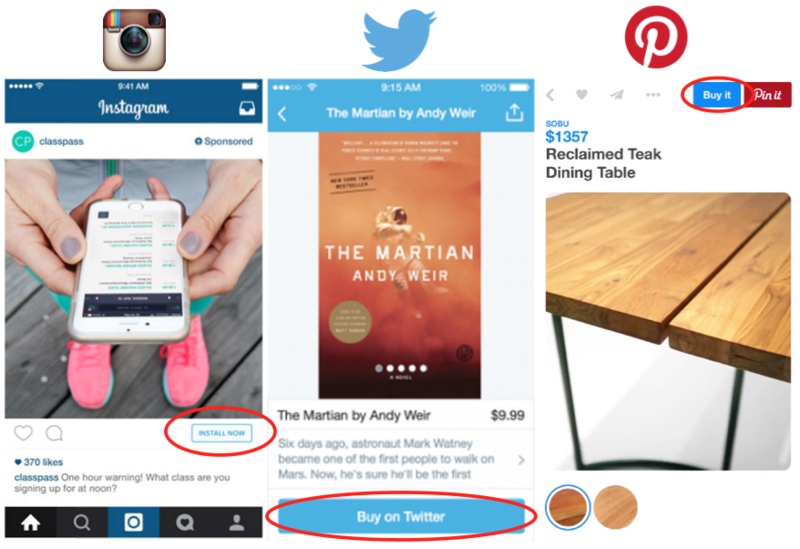 Pinterest, Instagram, Twitter, and Google will likely be the first wave, as more and more social media platforms and apps follow suit in implementing “buy buttons” and closing the mobile monetization gap. Photo by Kevin Shively at SimplyMeasured.com.